Description: Scatter at least 40 Frisbees (representing the Truffula Trees) inside the playing area (white square) with half of the Frisbees lying top side up and half of the Frisbees lying bottom side up(looks like a bowl) up. 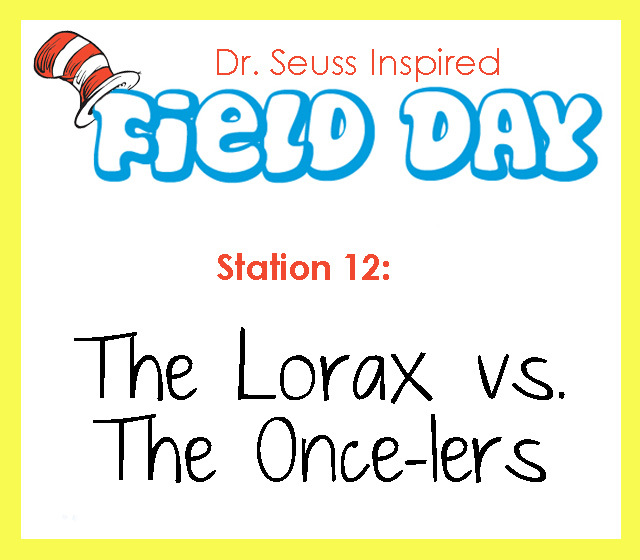 In this event there are 2 groups ­ the Lorax (representing Truffula Trees getting planted or picked up) and the Once-lers (representing Truffula Trees getting chopped or knocked down). One group will wear pinnies to distinguish between the two groups. On the signal to begin, the Once-lers job will be to flip each Frisbees that is lying top side up over to look like a bowl and the Lorax’s job will be to flip each Frisbees up (so it does not look like a bowl. They will run from Frisbees to Frisbees to do their jobs. Volunteers will stop play after 1 minute to change how they are moving. For example, after the first minute they will walk backwards, and after the second minute is up they will skip. The volunteers should then change the student’s job with the Lorax (up) now becoming a Once-ler (down). Let them run again, then hop, and slide. This event will continue until time has been called. **Note: Do not allow students to use their feet to kick over Frisbees. Only hands may be used to flip the Frisbees over and put them up. This entry was posted in End of the Year, Games, PE & Health and tagged Children, Dr. Seuss, Education, Elementary School, Games, Homeschool, Kids, outside games, PE & Health, Teacher Resources, Teachers, Teaching by Squarehead Teachers. Bookmark the permalink.